Smart electro-pneumatic positioners form the vital link between the control system and the valve. Smart electro-pneumatic positioners form the vital link between the control system and the valve. Electro-pneumatic positioners from ABB incorporates auto-adjust to reduce commissioning time and an adaption program provides for optimal control of the position until set point is reached. 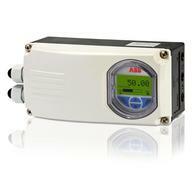 Click here to view ABB's full list of Electro-Pneumatic Positioners products.